At first glance, Blackberry’s Playbook is smaller than the Apple iPad, measuring 130mm x 193mm x 10mm compared to the iPad’s 243mm x 190mm x 13mm size. 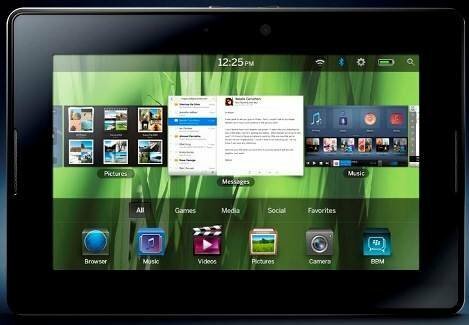 The Playbook runs RIM’s new operating system (OS), the Blackberry tablet OS, which RIM claims is “true symmetric multiprocessing”. RIM is boasting a dual-core 1 GHz processor in the Playbook, supported by 1 GB RAM. In comparison, Apple’s iPad only has 256MB RAM and a Cortex A8 1 GHz processor. Blackberry-maker Research in Motion (RIM) has launched its tablet, the Blackberry PlayBook. With RIM’s stronghold in the enterprise market, its new tablet looks set to build upon its corporate market position. Available from the second quarter of 2011, pricing is yet to be announced. But how does the Playbook measure up to Apple’s iPad?